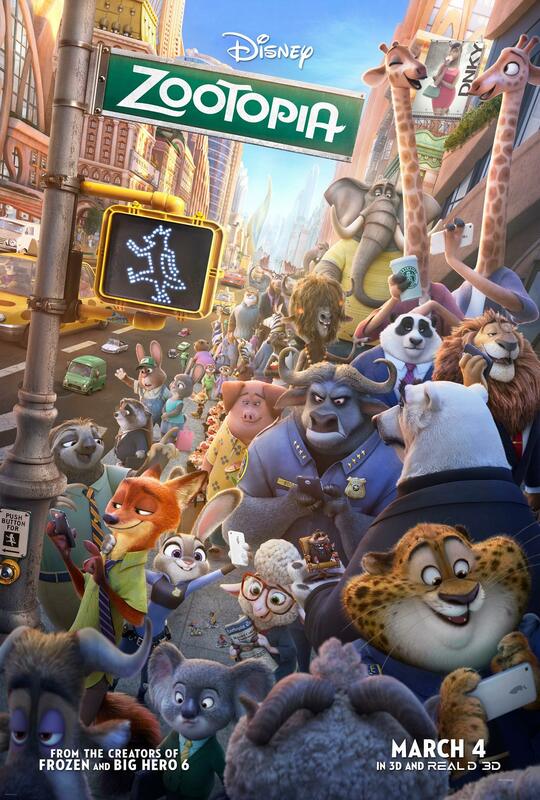 Disney continued its recent string of animated hits with Zootopia. Since Tangled reignited the somewhat moribund studio, Disney’s animated movies have collectively been great. From the excellent and original Wreck-it-Ralph to the megapopular Frozen, their recent movies have rivaled their Renaissance output in the early 90s. Zootopia does nothing to upset the apple cart despite being very different from what has come before. Zootopia is a mystery built on a strong and digestible message. Zootopia is about Judy Hopps, a rabbit who all her life has dreamed of movie from her farm home to the big city to become a police officer. This is despite the fact that no rabbit has ever been a cop. After she achieves this dream, she finds herself put on meter duty before forcing herself onto a missing person’s case. As Judy looks for a missing otter, she is helped by Nick Wylde, a fox scam artist who knows his way around the city. Together they get to the bottom of a mystery that could rock Zootopia to its core. Zootopia‘s prejudice metaphor has gotten the bulk of the attention, and while it is a good message, it doesn’t come through as clearly as it could. It starts with the prejudice against small herbivore like Judy before flipping it to be about prejudice against predators. I can’t tell if it is a well-reasoned, complex message or one that gets muddled somewhere along the way. I need to see the movie again to judge for sure. Either way, its main thrust is easy to determine and perfect for children, coming down to essentially be “don’t judge a book by its cover.” The part of the movie that works best is its mystery. It is a mystery for kids, but it should keep the viewer guessing until late in the game. Still, it follows that addictive formula of each clue leading to another clue as the two leads slowly sort things out. Those two leads are another triumph. Judy is bubbly and bright. She shoves the plot along with sheer enthusiasm. That contrast nicely with the sarcastic and street-wise Nick. It is not the most original pairing, but the formula is perfectly executed here. There isn’t as much time for the rest of the characters to be explored thanks to how much time is spent with the leads. And thanks to the story being a mystery, they can’t even spend much time with the villain. Still, the remaining characters are enjoyable if briefly sketched. Not all the bits work, like the naked hippy commune place, which goes on too long and doesn’t really amount to much or the mob boss Mr. Big. While the animation largely looks very good, there is a scene in the rain that looks kind of bad. Still, these are minor complaint in what is otherwise a really good film. I love that Zootopia is reminiscent of Robin Hood, which despite its apparent cheapness is one of the most charming of Disney’s output. Like that movie, this is one I could see kids throwing one time after time and continually enjoying. Zootopia may not be the best of Disney’s recent output, but it belongs in the conversation.